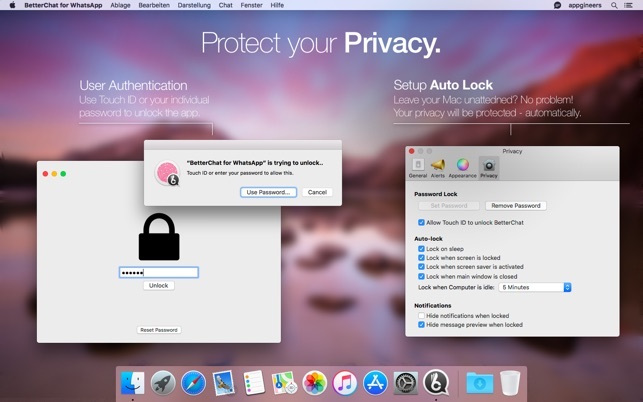 BetterChat for WhatsApp is brings the #1 WhatsApp Messenger to your Mac. 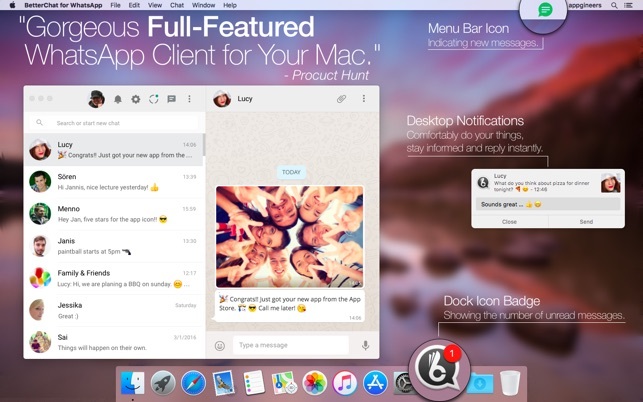 It is a gorgeous full-featured WhatsApp client for your Mac. 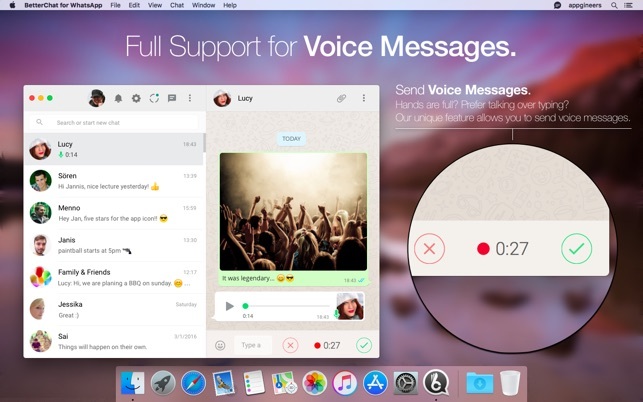 We designed it to fit perfectly into your workflow by providing a Notification Center integration, Voice Messages, FaceTime Camera, elegant user interface and much more. 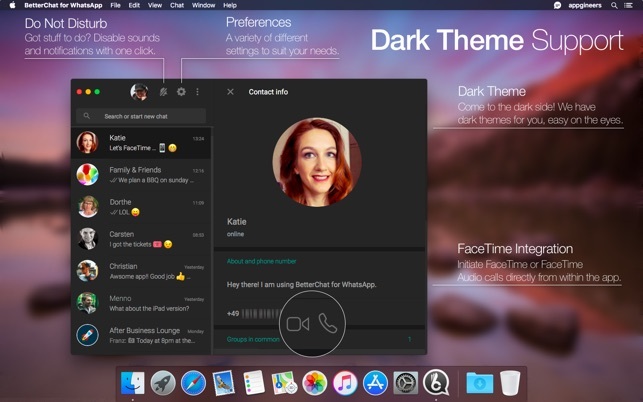 BetterChat has a unique DARK MODE and support to record, send and receive VOICE MESSAGES as well as CAPTURE PHOTOS and VIDEOS within the app. Packed with awesome features, BetterChat for WhatsApp is a must have for any for any Mac enthusiast using WhatsApp. ● Polished Mac style user interface supporting dark theme. ● Receive and SEND audio messages. ● Record videos and take photos directly in app. ● Polish your photos before sending them. ● Password lock to protect your privacy. ● Mini mode to safe screen space. ● Variety of notification sounds. ● One click silent mode, for when you’re busy. ● Place FaceTime calls from within the app. ● Automatically launch the app on login. ● Define a global shortcut to bring up the app window any time. ● Keep window always on top. 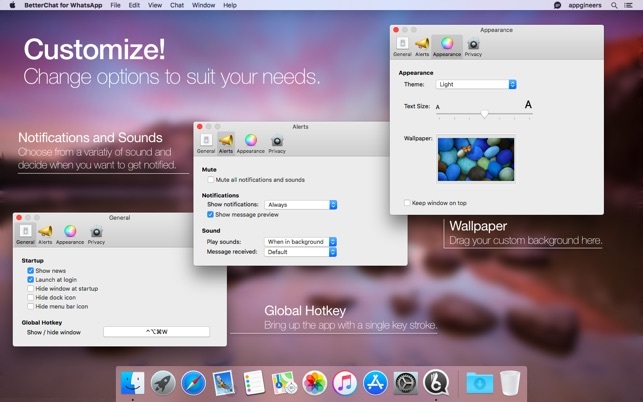 ● Drag & Drop feature to exchange media files. ● Reply instantly to incoming messages via the notification window. ● Hide the dock icon and run the app seamlessly in the background. ● Supports custom background images. ● Show unread message count in Dock icon badge. ● Indication of unread messages in menu bar. 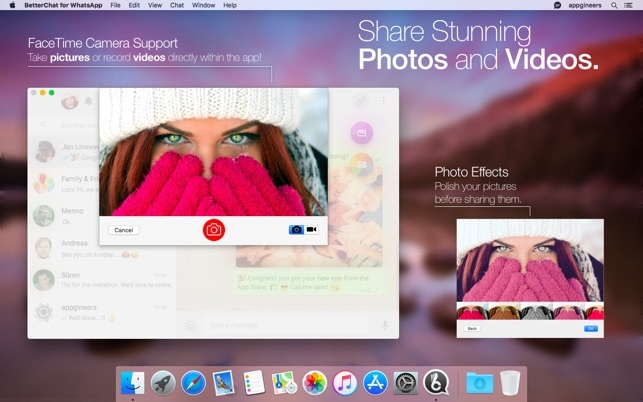 ● Download images and videos to your Mac. 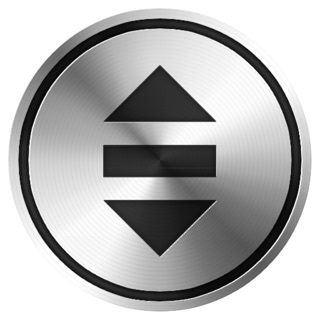 ● Allows you to save images and play videos. ● Wide support for shortcuts. ● Use full screen and split screen mode. Need help? - You can find answers to the most frequent questions on our website at http://appgineers.de/whatsapp. For other questions, feature requests or bug reports, please contact us on http://appgineers.de We'lI be happy to assist you! Important: BetterChat for WhatsApp requires a WhatsApp Web compatible device. (Open WhatsApp app on your mobile device, go to settings and check for the 'WhatsApp Web" option). Disclaimer: BetterChat for WhatsApp is a 3rd party app. The author of this software is not endorsed or affiliated with WhatsApp Inc. in any way. ● Gorgeous new black app icon. ● Always on top mode for your chat window. Basically bought everything on the appstore to try and find the best desktop solution for Whatsapp. Disappointed by all of them for one reason or another - no keyboard shortcuts, no ability to send audio, etc. Got frustrated enough that I started purchasing apps without any existing reviews, and these guys did it! Best of the bunch, beats the free WhatsChrome as well. Only thing I'd love are keyboard shortcuts to move up and down conversations, but command+f and command+n alone do most of the job already. Great work. I’ve tried a ***-load of apps for my Mac regarding WhatsApp. There are quite a few, even the ones you can find on GitHub. I came across this gem, and had no problem paying for it. The interface is beautiful, the QR scanning from my phone worked flawlessly and the dark mode is gorgeous. Love it. Amazing app, I just can’t find where to record and share videos. I love this app, it’s better than the other ones I used. It’s just that I can’t find where to record and share videos, can somebody help me?